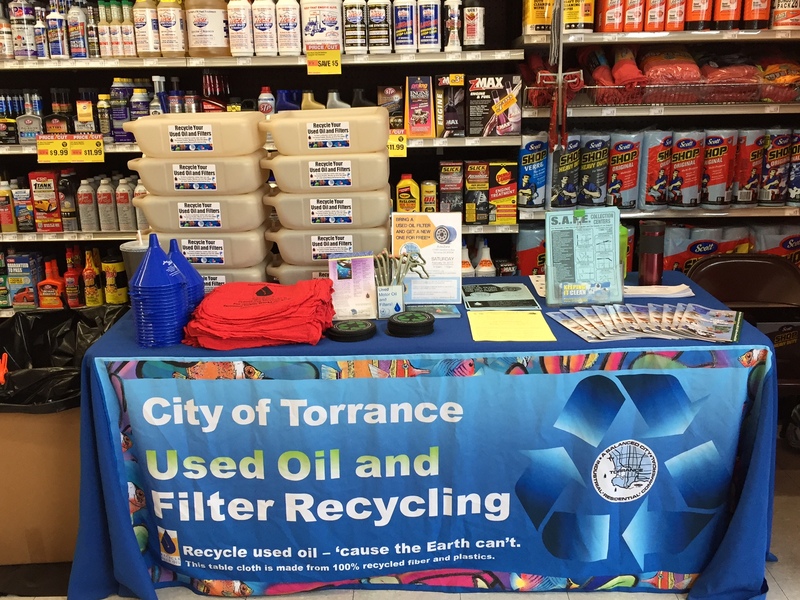 As part of the City of Torrance’s used oil recycling program, the City hosts a series of filter exchange events at auto parts stores around town. Since February of 2017, Torrance has hosted five (5) filter exchange events for residents. Events are held once a quarter at Used Oil Certified Collection Centers on Saturdays, 9am–1pm. 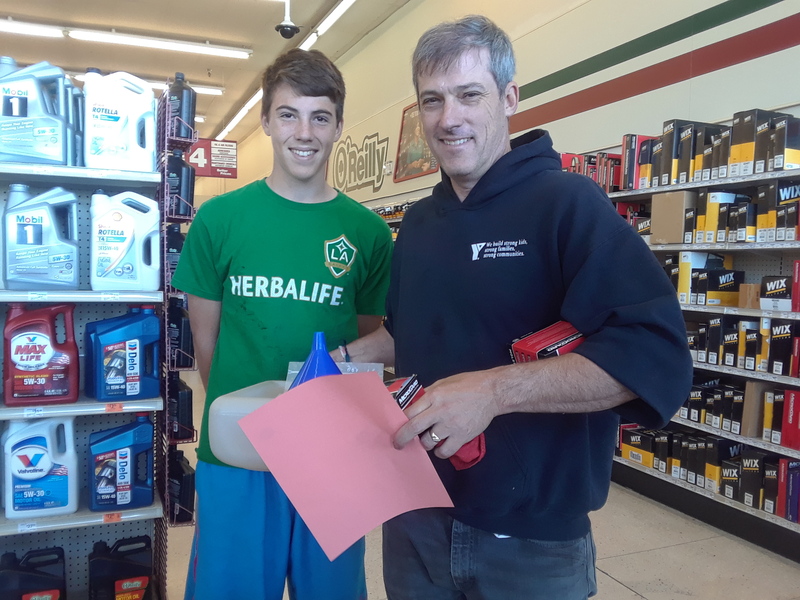 At filter exchanges, Torrance residents who bring in an old oil filter to recycle receive a voucher for a free, new filter to redeem in-store. 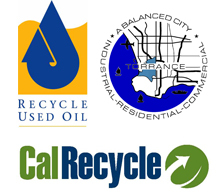 Residents who recycle their oil or filters at a City of Torrance filter exchange can receive oil change supplies, like a 6-quart oil drain container, shop towel, and funnel. Giving away filter exchange supplies at the February 17, 2018 filter exchange at AutoZone. Used Oil & Filter Recycling — Did You Know? Did You Know In California, 1 in 5 households have a Do-It-Yourself (DIY) oil changer. Did You Know There are more than 2,600 Used Oil Certified Collection Centers in California. There are 24 in Torrance. Did You Know If improperly disposed of, the oil from a single oil change (1 gallon) can pollute as much as 1 million gallons of drinking water. One million gallons is enough to supply drinking water for 50 people for a year. Did You Know In the U.S., less than 60% of the motor oil sold is recycled. Did You Know Recycled motor oil is often turned into re-refined oil. Re-refined oil is more energy efficient, better for the environment, costs less to produce, and just as effective as virgin motor oil. Recycling one gallon of motor oil produces 2.5 quarts of re-refined oil. Did You Know Even after draining, a typical used motor oil filter retains more than 10 fluid ounces of oil. 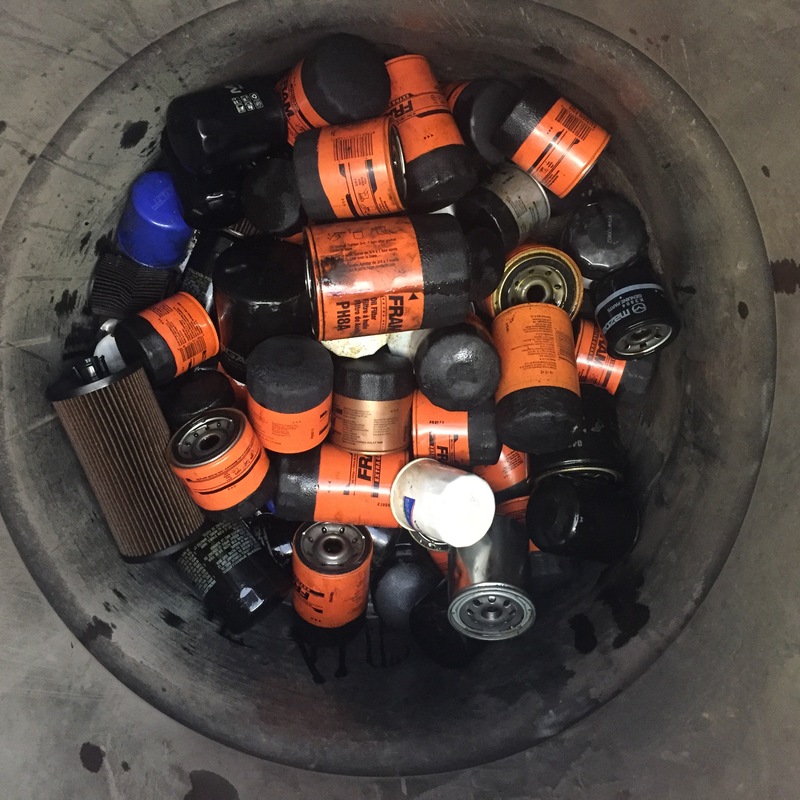 Disposing of oil filters in the trash is illegal. Did You Know Metal oil filters are made of steel, another recyclable resource. If all the metal oil filters sold in America each year were recycled, that would result in the recovery of about 160,000 tons of steel! 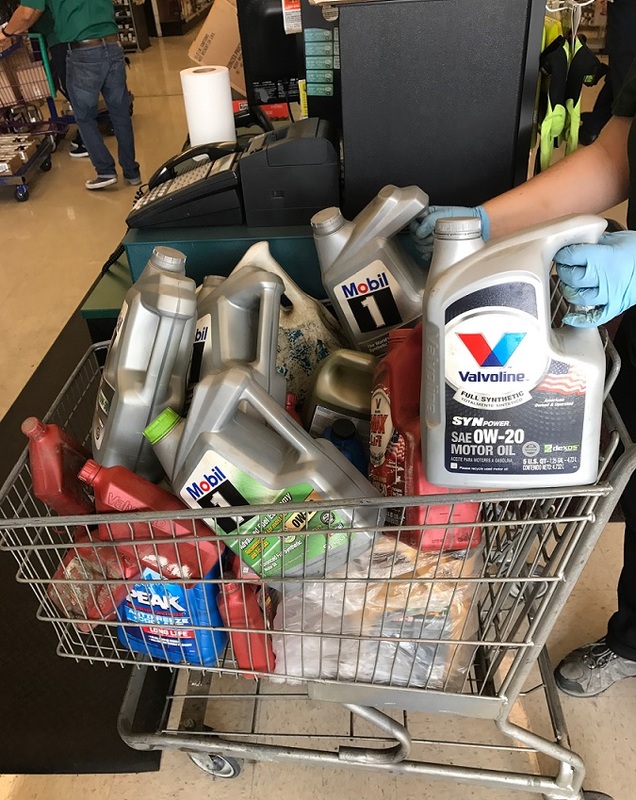 Did You Know DIY oil recyclers who recycle their motor oil at a Used Oil Recycling Certified Collection Center are eligible to receive 40 cents per gallon of oil brought in. 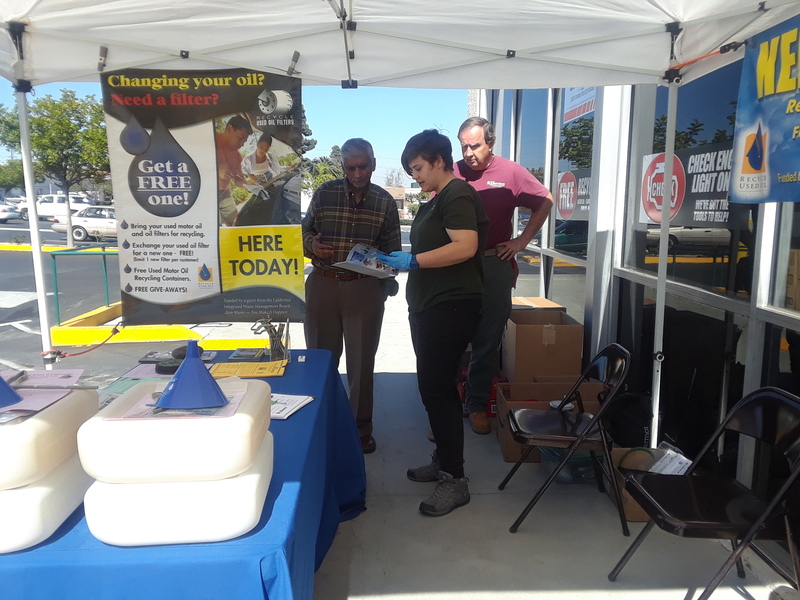 Torrance residents recycle at the City’s December 9th, 2017 filter exchange at O’Reilly Auto Parts. Did you know? Motor oil never wears out or “goes bad,” it just gets dirty. Recycling motor oil cleans out dirt, impurities, water and other liquid contaminants so the oil can be re-refined and used again and again. Both the used motor oil and the steel in automotive filters can be recycled. Make a difference in your community by volunteering! Want an opportunity to help keep your community safe and clean? 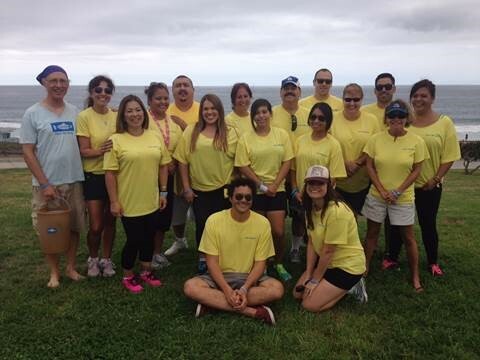 Join Team Torrance as a volunteer at the 34th annual Coastal Cleanup Day. Coastal Cleanup Day is Saturday, September 15th from 9am–12 noon. 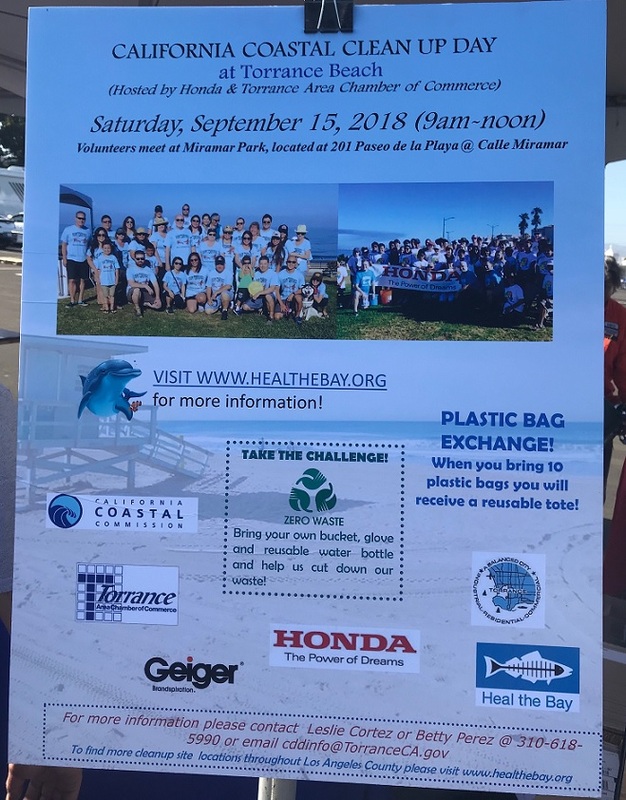 Co-hosted by Heal the Bay, the Ocean Conservancy, the California Coastal Commission, and the L.A. Department of Beaches and Harbors, this year’s Torrance event is sponsored by American Honda and the Torrance Area Chamber of Commerce, and will take place at Torrance Beach. For more info on the Torrance Beach Cleanup, please contact Beach Captain Leslie Cortez at (310) 618-5864 or Co-Captain Betty Perez at (310) 781-7627. Last year’s Torrance Beach Cleanup received a record number of volunteers, so sign up early this year. Volunteers meet at Miramar Park, 201 Paseo de la Playa @ Calle Miramar. There are many more opportunities to help keep our beaches & oceans clean at various locations throughout L.A. County. To sign-up, visit Heal the Bay. In 2017, Coastal Cleanup Day volunteers removed more than 800,000 pounds of trash and recyclables from California coast and inland waterways–in only 3 hours! Volunteering really makes an impact in our local communities. Visit the City of Torrance’s Coastal Cleanup Day website for more info. To volunteer for the Torrance Beach site, or any Coastal Cleanup Day event, simply register at Heal the Bay’s event page here. Why: To help keep our oceans, beaches, waterways, streams and parks clean and free of trash! Ages: Volunteers under 12 years old must be accompanied by an adult. Volunteers 18 years or younger must have their waiver signed by a parent or guardian.